Large eyes, 2 pairs of long wings. Head prolonged into a beak with biting mouthparts. Filiform antennae with 40 - 50 segments. Flight speed is 0.5 metres per second. 28 wing beats per second. Compare this with other insects. Tiny cerci in both sexes. Larvae chiefly subterranean, pupate in earthen cells in the soil. About 600 species worldwide, 23 in Europe and only 4 in the British Isles. The fossil record goes back 250 million years, to the Permian, making this insect a living fossil. 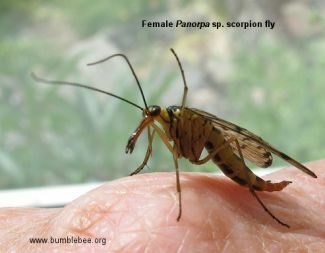 Scorpion flies got their name because the tail end of the adult male's abdomen is swollen and turns up to look like a scorpion (see above), but the insect is harmless. The swelling is actually the genital capsule. The female (below) is similar, but with a slim, straight abdomen. Both have the beautiful wing pattern seen in the photograph below. The adults are scavengers feeding on dead insects, rotting fruit, and even bird droppings. They prefer shady locations, and as they are weak fliers they tend to crawl about on vegetation. Although they are not common insects the shape of the head and the tail, if you find a male, makes them easy to recognise. Eggs are laid in the soil, and the larvae live in the soil where they scavenge in the soil and leaf litter eating vegetation as well as dead insects and invertebrates. The larvae have 3 pairs of thoracic (true) legs and 8 pairs of prolegs, so are caterpillar-like, but they loose their prolegs after the first moult. 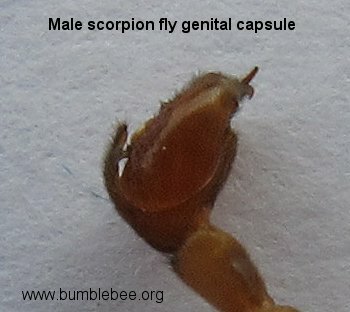 The swollen part of the male tail is actually the genital capsule (see above). Perhaps the most interesting, and most studied aspect of scorpion flies is their courtship and mating behaviour. During courtship the male presents the female with a dead insect as a nuptial gift. The female eats this during copulation. The female is attracted to the male by a pheromone he emits from pouches near the rear end of his abdomen. The male hangs from foliage by his front legs wafting this pheromone in the hope of attracting a female. When a female presents herself he shows her his nuptial gift. She probes it while he rubs her abdomen. If she rejects the gift she will refuse to mate. If she accepts is she will allow mating to begin. Although there are only 4 species in the British Isles, the females in the genus Panorpa are impossible to identify unless they are killed and dissected. 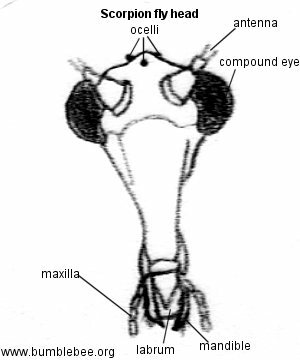 As you can see from the drawing below they have large compound eyes and 3 ocelli, giving them good eyesight and making them difficult to capture. Panorpa sp. have a wingspan of 12 - 15 mm, and adults are common from June - August on bushes and in woods. 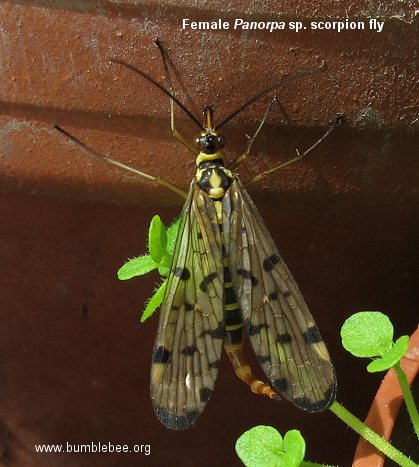 Scorpion flies are quite difficult to observe and capture as at the slightest disturbance they will drop into the vegetation where they are almost impossible to see, and too fragile to extricate without damage. 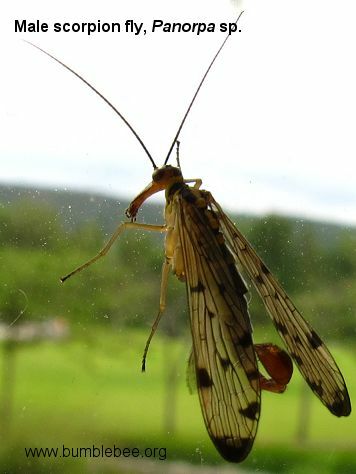 The trick is to get a net under the fly without disturbing it, and then only once the net is in position bring your hand or something close to t he fly from above causing the scorpion fly to drop into your net.